“Swiss Nano Dragster”, driven by scientists from Basel, has won the first international car race involving molecular machines. The race involved four nano cars zipping round a pure gold racetrack measuring 100 nanometres – or one ten-thousandth of a millimetre. The winning drivers, who actually shared first place with a US-Austrian team, were not sitting behind a steering wheel but in front of a computer. They used this to propel their single-molecule vehicle with a small electric shock from a scanning tunnelling microscope. During such a race, a tunnelling current flows between the tip of the microscope and the molecule, with the size of the current depending on the distance between molecule and tip. If the current is high enough, the molecule starts to move and can be steered over the racetrack, a bit like a hovercraft. The race track was maintained at a very low temperature (-268 degrees Celsius) so that the molecules didn’t move without the current. What’s more, any nudging of the molecule by the microscope tip would have led to disqualification. The race, held in Toulouse, France, and organised by the National Centre for Scientific Research (CNRS), was originally going to be held in October 2016, but problems with some cars resulted in a slight delay. In the end, organisers selected four of nine applicants since there were only four racetracks. The cars measured between one and three nanometres – about 30,000 times smaller than a human hair. The Swiss Nano Dragster is, in technical language, a 4′-(4-Tolyl)-2,2′:6′,2”-terpyridine molecule. The Swiss and US-Austrian teams outraced rivals from the US and Germany. The race is not just a bit of fun for scientists. The researchers hope to gain insights into how molecules move. *Emphasis added on May 9, 2017 at 12:26 pm PT. See my May 9, 2017 posting: Nanocar Race winners: The US-Austrian team for the other half of this story. This entry was posted in nanotechnology and tagged Austria, Basel University, Centre National de la Recherche Scientifique (CNRS), CNRS, France, Germany, motors, Nanocar Race, National Centre for Scientific Research (CNRS), Rémy Pawlak, scanning tunnelling microscope, STM, Swiss Nano Dragster, Swiss Nanoscience Institute, Switzerland, Tobias Meier, University of Basel, US on May 9, 2017 by Maryse de la Giroday. Nanocars will compete for the first time ever during an international molecule-car race on April 28-29, 2017 in Toulouse (south-western France). The vehicles, which consist of a few hundred atoms, will be powered by minute electrical pulses during the 36 hours of the race, in which they must navigate a racecourse made of gold atoms, and measuring a maximum of a 100 nanometers in length. They will square off beneath the four tips of a unique microscope located at the CNRS’s Centre d’élaboration de matériaux et d’études structurales (CEMES) in Toulouse. The race, which was organized by the CNRS, is first and foremost a scientific and technological challenge, and will be broadcast live on the YouTube Nanocar Race channel. Beyond the competition, the overarching objective is to advance research in the observation and control of molecule-machines. More than just a competition, the Nanocar Race is an international scientific experiment that will be conducted in real time, with the aim of testing the performance of molecule-machines and the scientific instruments used to control them. The years ahead will probably see the use of such molecular machinery — activated individually or in synchronized fashion — in the manufacture of common machines: atom-by-atom construction of electronic circuits, atom-by-atom deconstruction of industrial waste, capture of energy…The Nanocar Race is therefore a unique opportunity for researchers to implement cutting-edge techniques for the simultaneous observation and independent maneuvering of such nano-machines. 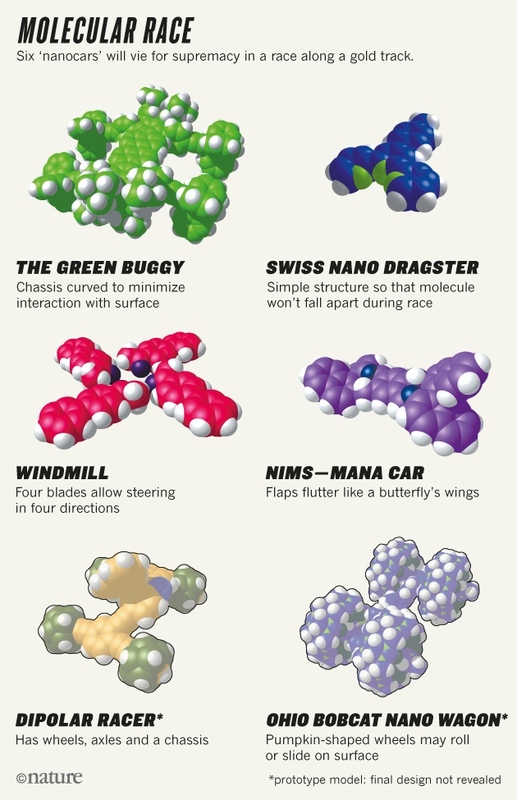 The term nanocar is actually a misnomer, because the molecules involved in this race have no motors. (Future races may incorporate them, Joachim says.) And it is not clear whether the molecules will even roll along like wagons: a few designs might, but many lack axles and wheels. Drivers will use electrons from the tip of a scanning tunnelling microscope (STM) to help jolt their molecules along, typically by just 0.3 nano-metres each time — making 100 nanometres “a pretty long distance”, notes physicist Leonhard Grill of the University of Graz, Austria, who co-leads a US–Austrian team in the race. Contestants are not allowed to directly push on their molecules with the STM tip. Some teams have designed their molecules so that the incoming electrons raise their energy states, causing vibrations or changes to molecular structures that jolt the racers along. Others expect electrostatic repulsion from the electrons to be the main driving force. Waka Nakanishi, an organic chemist at the National Institute for Materials Science in Tsukuba, Japan, has designed a nanocar with two sets of ‘flaps’ that are intended to flutter like butterfly wings when the molecule is energized by the STM tip (see ‘Molecular race’). Part of the reason for entering the race, she says, was to gain access to the Toulouse lab’s state-of-the-art STM to better understand the molecule’s behaviour. Eric Masson, a chemist at Ohio University in Athens, hopes to find out whether the ‘wheels’ (pumpkin-shaped groups of atoms) of his team’s car will roll on the surface or simply slide. “We want to better understand the nature of the interaction between the molecule and the surface,” says Masson.. Simply watching the race progress is half the battle. After each attempted jolt, teams will take three minutes to scan their race track with the STM, and after each hour they will produce a short animation that will immediately be posted online. That way, says Joachim, everyone will be able to see the race streamed almost live. The Toulouse laboratory has an unusual STM with four scanning tips — most have only one — that will allow four teams to race at the same time, each on a different section of the gold surface. Six teams will compete this week to qualify for one of the four spots; the final race will begin on 28 April at 11 a.m. local time. The competitors will face many obstacles during the contest. Individual molecules in the race will often be lost or get stuck, and the trickiest part may be to negotiate the two turns in the track, Joachim says. He thinks the racers may require multiple restarts to cover the distance. The best moments of the first-ever international race of molecule- cars. This entry was posted in manufacturing, nanotechnology and tagged Austria, Centre d'Élaboration de Matériaux et d'Études Structurales (CEMES), Centre National de la Recherche Scientifique (CNRS), Christian Joachim, CNRS, Davide Castelvecchi, Eric Masson, France, Gwénaël Rapenne, Japan, Japan National Institute for Materials Science, Leonhard Grill, molecule-car race, molecule-machines, Nanocar Race, Ohio University, Paul Sabatier, scanning tunnelling microscope (STM), Université Toulouse III, University of Graz, US, Waka Nakanishi, YouTube Nanocar Race channel on May 1, 2017 by Maryse de la Giroday. Delia Milliron, an associate professor in the McKetta Department of Chemical Engineering, and her team’s advancement is a new low-temperature process for coating the new smart material on plastic, which makes it easier and cheaper to apply than conventional coatings made directly on the glass itself. The team demonstrated a flexible electrochromic device, which means a small electric charge (about 4 volts) can lighten or darken the material and control the transmission of heat-producing, near-infrared radiation. Such smart windows are aimed at saving on cooling and heating bills for homes and businesses. The research team is an international collaboration, including scientists at the European Synchrotron Radiation Facility and CNRS in France, and Ikerbasque in Spain. Researchers at UT Austin’s College of Natural Sciences provided key theoretical work. Milliron and her team’s low-temperature process generates a material with a unique nanostructure, which doubles the efficiency of the coloration process compared with a coating produced by a conventional high-temperature process. It can switch between clear and tinted more quickly, using less power. The new electrochromic material, like its high-temperature processed counterpart, has an amorphous structure, meaning the atoms lack any long-range organization as would be found in a crystal. However, the new process yields a unique local arrangement of the atoms in a linear, chain-like structure. Whereas conventional amorphous materials produced at high temperature have a denser three-dimensionally bonded structure, the researchers’ new linearly structured material, made of chemically condensed niobium oxide, allows ions to flow in and out more freely. As a result, it is twice as energy efficient as the conventionally processed smart window material. At the heart of the team’s study is their rare insight into the atomic-scale structure of the amorphous materials, whose disordered structures are difficult to characterize. Because there are few techniques for characterizing the atomic-scale structure sufficiently enough to understand properties, it has been difficult to engineer amorphous materials to enhance their performance. Graeme Henkelman, a co-author on the paper and chemistry professor in UT Austin’s College of Natural Sciences, explains that determining the atomic structure for amorphous materials is far more difficult than for crystalline materials, which have an ordered structure. In this case, the researchers were able to use a combination of techniques and measurements to determine an atomic structure that is consistent in both experiment and theory. “Such collaborative efforts that combine complementary techniques are, in my view, the key to the rational design of new materials,” Henkelman said. Milliron believes the knowledge gained here could inspire deliberate engineering of amorphous materials for other applications such as supercapacitors that store and release electrical energy rapidly and efficiently. The Milliron lab’s next challenge is to develop a flexible material using their low-temperature process that meets or exceeds the best performance of electrochromic materials made by conventional high-temperature processing. “We want to see if we can marry the best performance with this new low-temperature processing strategy,” she said. This entry was posted in energy, nanotechnology and tagged Agnieszka Poulain, Alejandro Fernandez-Martinez, Anna Llordés, Camila A. Saez Cabezas, Centre National de la Recherche Scientifique (CNRS), CNRS, Delia J. Milliron, Delia Milliron, electrochromic material, European Synchrotron Radiation Facility, flexible electrochromic device, flexible smart window material, France, Graeme Henkelman, Ikerbasque, Linear topology in amorphous metal oxide electrochromic networks obtained via low-temperature solution processing, low-temperature process, Omid Zandi, Penghao Xiao, Spain, Tom Lee, University of Texas at Austin, windows, Yang Wang on September 14, 2016 by Maryse de la Giroday. An international team of researchers including Professor Federico Rosei and members of his group at INRS (Institut national de la recherche scientifique) has developed a new strategy for fabricating atomically controlled carbon nanostructures used in molecular carbon-based electronics. An article just published in the prestigious journal Nature Communications presents their findings: the complete electronic structure of a conjugated organic polymer, and the influence of the substrate on its electronic properties. The researchers combined two procedures previously developed in Professor Rosei’s lab—molecular self-assembly and chain polymerization—to produce a network of long-range poly(para-phenylene) (PPP) nanowires on a copper (Cu) surface. Using advanced technologies such as scanning tunneling microscopy and photoelectron spectroscopy as well as theoretical models, they were able to describe the morphology and electronic structure of these nanostructures. “We provide a complete description of the band structure and also highlight the strong interaction between the polymer and the substrate, which explains both the decreased bandgap and the metallic nature of the new chains. Even with this hybridization, the PPP bands display a quasi one-dimensional dispersion in conductive polymeric nanowires,” said Professor Federico Rosei, one of the authors of the study. Although further research is needed to fully describe the electronic properties of these nanostructures, the polymer’s dispersion provides a spectroscopic record of the polymerization process of certain types of molecules on gold, silver, copper, and other surfaces. It’s a promising approach for similar semiconductor studies—an essential step in the development of actual devices. The results of the study could be used in designing organic nanostructures, with significant potential applications in nanoelectronics, including photovoltaic devices, field-effect transistors, light-emitting diodes, and sensors. This study was designed by Yannick Fagot-Revurat and Daniel Malterre of Université de Lorraine/CNRS, Federico Rosei of INRS, Josh Lipton-Duffin of the Institute for Future Environments (Australia), Giorgio Contini of the Italian National Research Council, and Dmytro F. Perepichka of McGill University. […]The researchers were generously supported by Conseil Franco-Québécois de coopération universitaire, the France–Italy International Program for Scientific Cooperation, the Natural Sciences and Engineering Research Council of Canada, Fonds québécois de recherche – Nature et technologies, and a Québec MEIE grant (in collaboration with Belgium). 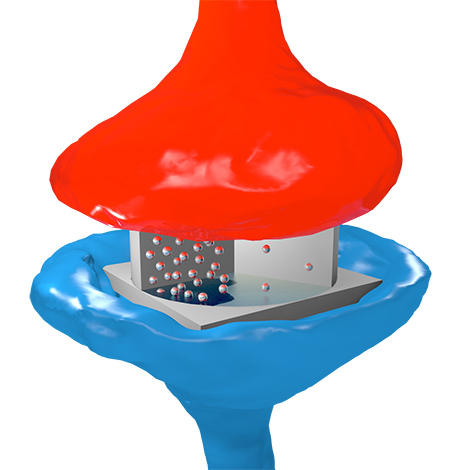 *’ScienceDaily’ corrected to ‘phys.org’ on Tues., Jan. 5, 2016 at 1615 PST. This entry was posted in electronics, nanotechnology and tagged Australia, Belgium, Bertrand Kierren, Canada, CNRS, Conseil Franco-Québécois de coopération universitaire, Daniel Malterre, Dmitrii F. Perepichka, Dmytro F. Perepichka, Federico Rosei, Fonds québécois de recherche – Nature et technologies, France, France–Italy International Program for Scientific Cooperation, François Bertran, Gianluca Galeotti, Giorgio Contini, Gisèle Bolduc, Guillaume Vasseur, INRS, Institut national de la recherche scientifique, Institute for Future Environments, Italian National Research Council, Josh Lipton-Duffin, Liangbo Liang, Luc Moreau, Luis Cardenas, Marco Di Giovannantonio, McGill University, Muriel Sicot, Natural Sciences and Engineering Research Council of Canada, NSERC, Patrick Le Fèvre, poly(para-phenylene) (PPP) nanowires on a copper (Cu) surface, Quasi one-dimensional band dispersion and surface metallization in long-range ordered polymeric wires, Quebec, Université de Lorraine, Vincent Meunier, Yannick Fagot-Revurat on January 5, 2016 by Maryse de la Giroday. Mid October [Oct. 14 -16, 2015], the Graphene & 2D Materials Canada 2015 International Conference & Exhibition (www.graphenecanada2015.com) will take place in Montreal (Canada). On the second day of the event (15th October, 2015), an Industrial Forum will bring together top industry leaders to discuss recent advances in technology developments and business opportunities in graphene commercialization. At this stage, the event unveils 38 keynote & invited speakers. On the Industrial Forum 19 of them will present the latest in terms of Energy, Applications, Production and Worldwide Initiatives & Priorities. Graphene Canada 2015 is already supported by Canada’s leading graphene applications developer, Grafoid Inc., Tourisme Montréal and Université de Montréal. It’s billed as a ‘Canada Graphene 2015’ and, as I recall, these types of events don’t usually have so many other countries listed as organizers. For example, UK Graphene 2015 would have mostly or all of its organizers (especially the leads) located in the UK. Getting to the Canadian content, I wrote about Grafoid at length tracking some of its relationships to companies it owns, a business deal with Hydro Québec, and a partnership with the University of Waterloo, and a nonrepayable grant from the Canadian federal government (Sustainable Development Technology Canada [SDTC]) in a Feb. 23, 2015 posting. Do take a look at the post if you’re curious about the heavily interlinked nature of the Canadian graphene scene and take another look at the list of speakers and their agencies (Mark Gallerneault of ALCERECO [partially owned by Grafoid], Carla Miner of SDTC [Grafoid received monies from the Canadian federal department], Federico Rosei of INRS–EMT, Université du Québec [another Quebec link], Aiping Yu, University of Waterloo [an academic partner to Grafoid]). The Canadian graphene community is a small one so it’s not surprising there are links between the Canadian speakers but it does seem odd that Lomiko Metals is not represented here. Still, new speakers have been announced since the news release (e.g., Frank Koppens of ICFO, Spain, and Vladimir Falko of Lancaster University, UK) so time remains. On March 16, 2015 Graphene 3D Lab (TSXV:GGG) (OTCQB:GPHBF) announced that it launched commercial sales of its Conductive Graphene Filament for 3D printing. The filament incorporates highly conductive proprietary nano-carbon materials to enhance the properties of PLA, a widely used thermoplastic material for 3D printing; therefore, the filament is compatible with most commercially available 3D printers. The conductive filament can be used to print conductive traces (similar to as used in circuit boards) within 3D printed parts for electronics. So, that’s all I’ve got for Canada’s graphene scene. This entry was posted in graphene, nanotechnology and tagged 3D printing, Aiping Yu, AIST, ALCERECO, Angstron Materials, Belgium, Bor Z. Jang, Byung Hee Hong, Canada, Carla Miner, Catalan Institute of Nanoscience and Nanotechnology (ICN2) IIT, Centre National de la Recherche Scientifique, Chun-Yun Sung, CNRS, conductive graphene filament, Elena Polyakova, Federico Rosei, France, Frank Koppens, Gary Economo. Grafoid, Gordon Chiu, Graphene 3D Labs, Graphene Canada 2015, Graphene Laboratories, Graphene Square, Graphenea, Gregory Pognon, Haydale Graphene Industries, Hua Zhang, IBM T.J. Watson Research Center, ICEX, ICFO, IDTechEx, INRS–EMT, Italy, Japan, Jestico + Whiles, Jesus de la Fuente, Khasha Ghaffarzadeh, Korea, Lancaster University, Lockheed Martin, Lomiko Metals, Mark Gallerneault, Masataka Hasegawa, McGill University, MSE-NTU, Nanomagnetics Instruments, Ray Gibbs, RAYMOR NanoIntegris, Samsung Advanced Institute of Technology (SAIT), Seongjun Park, Singapore, SNU, Spain, Texas Instruments, THALES Research & Technology, Tony Ling, Tourisme Montréal, UK. Shu-Jen Han, Université catholique de Louvain, Université de Montréal. Phantoms Foundation, Université du Québec, University of Waterloo, USA, Vladimir Falko, Xerox Research Centre of Canada (XRCC) on July 17, 2015 by Maryse de la Giroday.